Today was driven by a sketch and a colour combo! I liked the simplicity of the Mojo Monday sketch for this week. I needed a stamp set to work well with it and a colour palette to set it off. I did a full stamp inventory and finally settled on Amazing Birthday. Because of the striking graphics of this stamp set, I needed a bold, dramatic colour combination. I chose Basic Black, Whisper White and Crushed Curry. I really love Crushed Curry because it is such a warm yellow. Yellow can look anemic if it doesn't have some substance to it, and Crushed Curry has lots of it! I stamped the main sentiment in StazOn Jet Black on Whisper White cardstock and then coloured in some areas using a Crushed Curry (does anyone else keep typing Cursed Curry?) 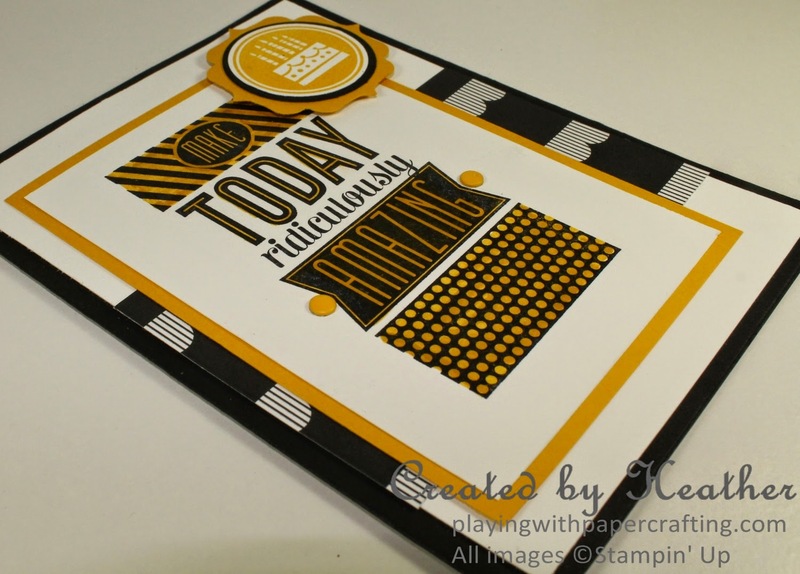 Stampin' Write Marker. I added a couple of Crushed Curry Candy Dots to highlight "Amazing". The DSP in the background is from the Back to Black collection and is perfectly suited for a horizontal panel with the little scallops. The birthday cake comes from the Amazing Birthday set as well. It is stamped in Crushed Curry ink and the 1-1/4" Circle Punch is a perfect fit. I punched out a Basic Black circle using the 1-3/8" Circle punch and layered the birthday cake with it. Then I used the Bracket Label Punch on some Crushed Curry cardstock for the final backing touch. 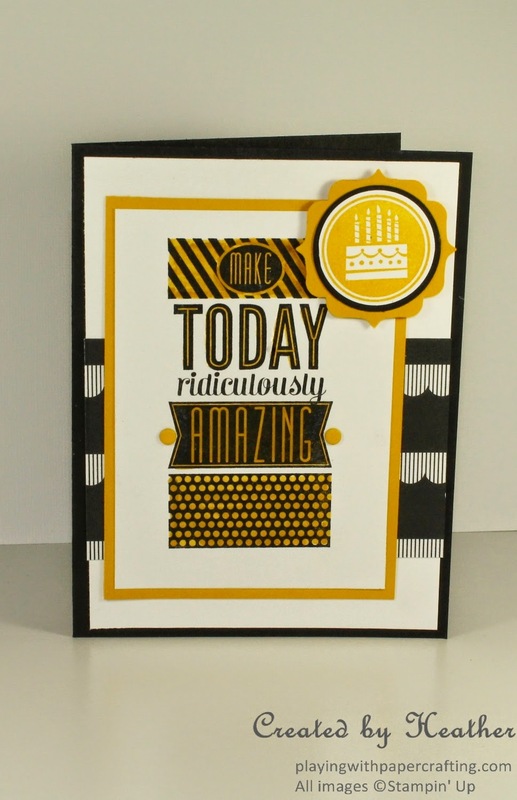 I mounted them all on the card front with a Stampin' Dimensional. This is a simple, yet bold design that really makes a statement! Hope you'll give it a try! OOO! I love how bold and graphic this is. Very cool! Thanks, Becca! Yellow and black together give that effect. Thanks, Bernie. It was fun to make.